Are you interested in archery? Although there are many bows to choose from, the compound bow is a great improvement from the recurve bow or longbow. There is a mechanical advantage within the cam that allows the draw weight to be manipulated at some position through the draw length, making it a great bow for the beginner. Keep in mind that there are a few items you will want to consider when comparing beginner compound bows especially because it might be challenging to find the right one for your needs. In this review, you will learn about archery technology and specifications that can help guide your decision in finding the best beginner compound bow. Genesis Original Bow – One Bow Fits All! One reason this bow made it to the list of best beginner compound bows is that it is the official bow of the National Archery in the Schools Program (NASP). Since it is a preferred tool to teach the sport, it is most likely a great bow for anyone to start off with. The Genesis Original Bow works well for all ages and athletic abilities because there is no specific draw length requirement. It could even be used as a family bow since it more or less is a one size fits all compound bow. Something to keep in mind is the draw only goes up to 20 pounds and can be lowered to 10 pounds, so this bow is not intended for hunting. Axle-to-axle it is 35 ½ inches with a 7 5/8 inch brace height. 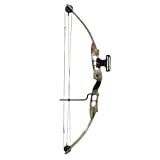 Most Amazon customers are happy with the purchase of the Genesis Original Bow and find it to be very accurate. The price point of this bow makes it a marvelous value since it can be used by the whole family. The groupings are consistent no matter who is using the bow and it comes ready to shoot. Not to mention, there are a variety of color choices for the Genesis Original Bow. If you are looking for an easy to use, easy to draw compound bow, then you might appreciate the Barnett Outdoors Team Realtree Banshee Quad Junior Compound Bow Archery Set. This bow has a 25 pound draw and a draw length of 24-26 inches. Since this item is a set, it comes with two 26 inch fiberglass arrows, forearm guard, archery tab and paper target. Most beginning archers are very happy with their purchase and would recommend this bow for those who are just starting out and eventually want to upgrade. Since this bow is less than $50, it is a small investment for a beginner to learn the basics and practice their skills. The archer planning to use this bow will need to have some strength to pull back the drawstring. Therefore, this bow might not be the best choice for someone with a smaller build. Over and over, Amazon reviewers mention that this is a powerful bow. On the flip side, reviewers are not as satisfied with the arrows included, but this is easily remedied by purchasing different arrows. SAS Sergeant – Fantastic start into “real” archery. The SAS Sergeant made it to our list of best beginner compound bows because it is quite the powerhouse. Axle to axle the bow is 40.5 inches with a maximum speed of 235 feet per second. Furthermore, it has a draw weight of 40-65 pounds and the draw length is adjustable from 27 inches to 29 inches. The brace height on this particular bow is 7.25 inches with a let off of 67%. Another feature of this bow is the piece-layered limb, which will help the bow stand the test of time. The recommended arrow for this four pound bow is 30 inches. Even though it is great for backyard target shooting, with the right arrows, tuning, and setup it can also be used to hunt deer or smaller game. This bow might be your best bet if you plan to use it for hunting and target shooting. Some reviewers preferred to buy a different site and rest for the bow to make an upgrade to what was included. Price is usually a guiding factor when purchasing any product, but keep in mind that the first bow you buy won’t necessarily be the last bow you purchase, especially if archery becomes your hobby. A beginner archer should focus on buying a bow that is both sturdy and cost effective when they first start out. Some of the more expensive bows will cost upward of $500. As a beginner, you can find a good bow within the $100-$200 range, and there are even beginner bows that are less than $100. When you are beginning the sport of archery, you should focus on accurately hitting your target. Oftentimes, more speed will equal less accuracy for the beginner archer so you don’t necessarily need to find a bow with the most speed. With this in mind, look for a bow with an IBO speed that is less than 330FPS. Transition to an advanced bow once you have practiced the fundamentals of the sport and are comfortable. ​Importantly, you must know your draw length before buying a compound bow or any other bow. The right draw length will increase the power you get out of your bow, and will also decide the length of the arrow you buy. If your draw length is too short or too long, you won’t be as accurate and may damage your bow. Thedraw weightis the total pounds of force necessary to get the bow into a fully drawn position. One advantage of a compound bow is that they are easily adjustable for draw weight. A beginner archer should make sure they are able to draw the bow steadily and without shaking. Some bows have a non-specific draw length, which allows more than one archer to use the same bow, even if they are different sizes and this could be advantageous if a family is sharing one bow. Most compound bows have a highlet-off, which is the point where it becomes easier to pull or hold the bow. A traditional bow reaches its max weight at full draw, while a compound bow achieves the full weight around half-way back and then becomes easier to pull. The benefit of a higher let-off is that the shooter can take time to aim and release the arrow. Keep in mind what your bow will be used for once it is purchased. Are you mainly going to use it for target practice or is your goal to find a bow that can be utilized for hunting? There are four different types ofcamsincluding single, hybrid, binary or twin. Although all cams are not created equal, the style or type isn’t as important as thegrindof the cam and you will want to make sure the cams on the bow operate smoothly. Ultimately, you will have to decide which bow is best for your needs, but we prefer the Genesis Original Bow because it is so versatile. You can buy one bow and share it with a child or another adult because there is no draw length requirement. This bow rivals the others because you can take it out of the packaging and be ready to start practicing. It might be more expensive than some of the other beginner bows in this review, but the versatility outweighs the cost. We have provided you with the information you need to choose the best beginner compound bow.